Do you feel like you need to do a ton of really deep cleaning when you take down all the Christmas. I think that's because I have so much "stuff" out that I just clean through the middle. So when it is all finally put away, it is nice to have something simple and easy and a really clean room. Since my living room and dining area are all one room, I really need to try and get the whole area done at once. Finally done, and it looks so much fresher. As you can see, not a whole lot changed, just got rid of the tree and all the Christmas decor, but kept the basic accessories and colors. I don't know why a faux tree sheds so much, and then there is all the glitter everywhere. I have vacuumed thoroughly a couple of times and I still see glitter every once in a while. With all of that removed, this is what I generally do to get a room back in shape. My checklist for deep cleaning is really basic. 1. Wipe down the walls with a clean cloth to remove all dust and clean any dirty spots. 2. Wash baseboards and all woodwork. 4. Vacuum the drapes and blinds. 5. Vacuum all the upholstered furniture. 6. Clean and polish all the wood furniture. 7. Move furniture and vacuum and clean the floors well, making sure all the corners are done. 8. Now have fun and decorate to your hearts content. 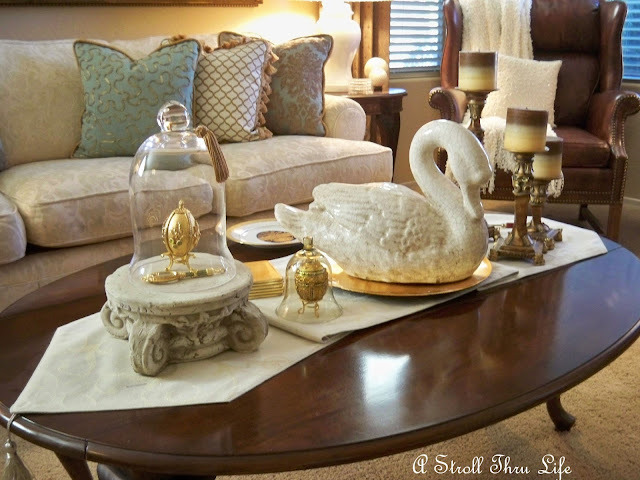 The coffee table was redone with just a simple vignette. Love the swam, so graceful. 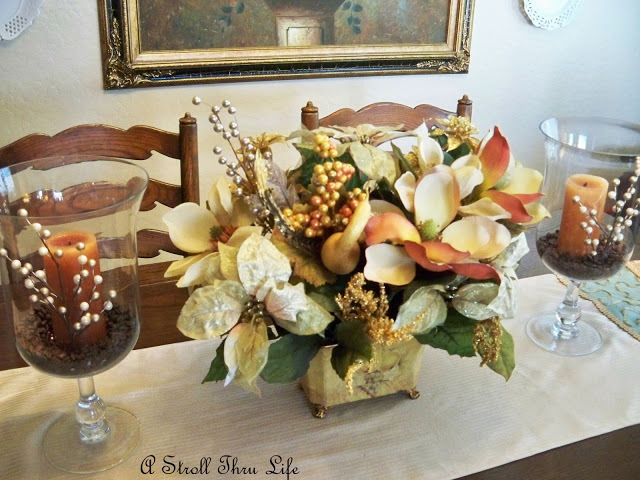 I am still enjoying the touches of gold after the holidays, so I used a charger and some Fabrege eggs. I kept the aqua for now, just so perfect for a winter color scheme. The dining area needs to coordinate, so I just moved the floral arrangement I had on the coffee table to the dining table. This was my Christmas centerpiece. I love that tinsel tree I found and I am still trying to figure out some way to use it other than just Christmas. Any ideas? The aqua, rust and pearls in the sconces and floral arrangement compliment the rest of the room and the painting, so moving them here from the coffee table worked great. I feel so refreshed when I walk in her now, so nice to have a clean simple room. Makes the house feel so much bigger and that is a good thing since it is really small. Marty, your home is always so beautiful. I always deep clean after the holidays. I also move things around too. Your living room looks wonderful, Marty! I noticed that about the artificial trees, too. I felt like I vacuumed up just as many artificial needles as if I had a real tree! You have an absolutely beautiful home. I love a good, thorough cleaning as well, it feels GOOD! Hope too see you at the Nest again soon, always so nice when you pop in. Everything looks fabulous and always does! I love the blues and the winter look! I always feel good when I know my house had a deep clean! 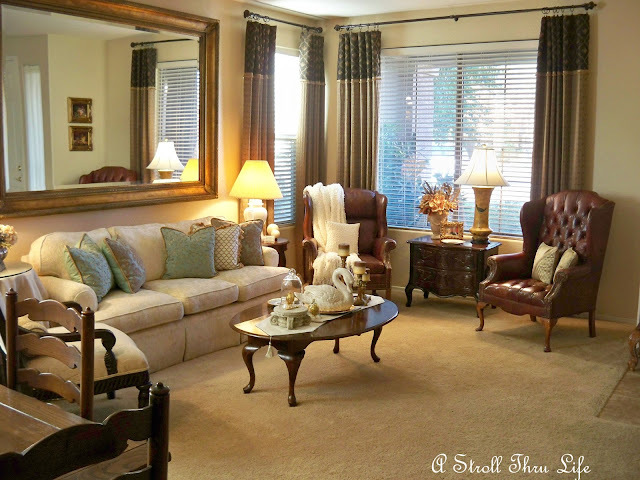 Your living room always looks gorgeous Marty! Marty - Your LR/DR looks so pretty. It looks so warm and cozy! 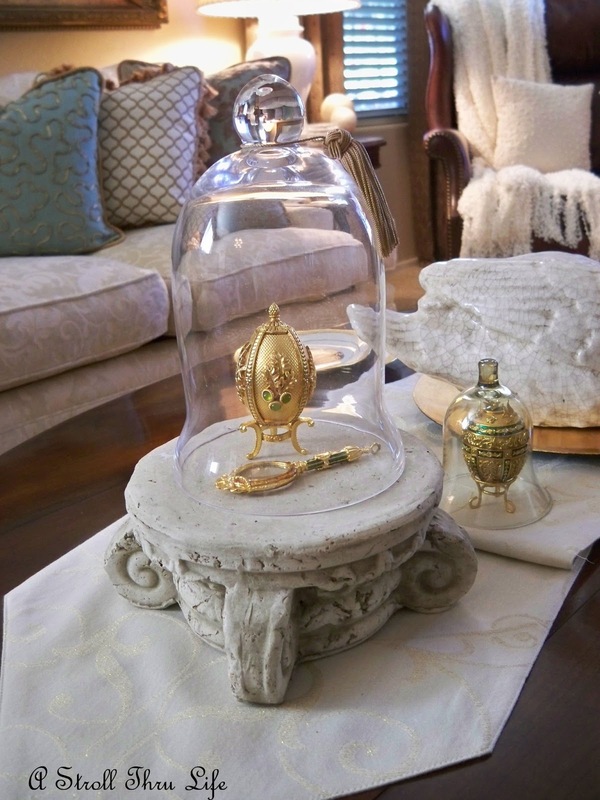 Marty your home is gorgeous!Your Fabrege eggs are beautiful! I love how you have them showcased!It all looks lovely! We did a big clean after taking down the Christmas decorations ..not as thorough as yours though! Wow!! Why is it that artificial trees shed so much..you're right? I keep finding fake needles! STILL! that cloche is always the focal piece for me.. love it. I keep seeing sparkles on the floor when the light hits them just right- even after 4 vacumm sessions. I guess the steam cleaner will have to come out as soon as it isnt so humid in nc. It look so fresh and calm, I love rooms that sooth, especially after busy holidays. I love that swan! All so very beautiful and cozy ! 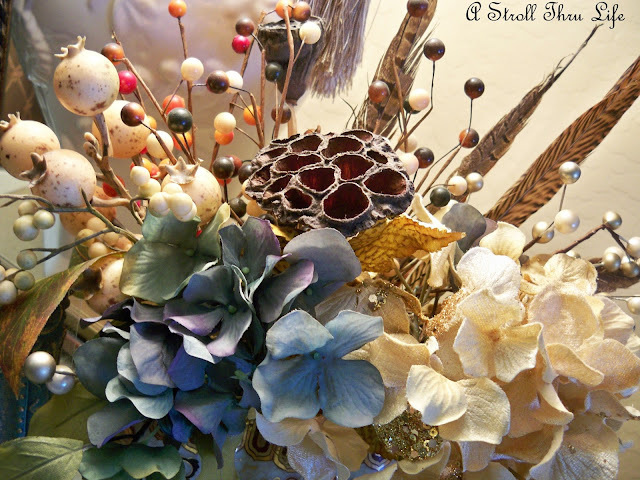 I do like your header and your thanks for visiting wonderful web art ! Thanks for sharing with us . Have a good evening ! Marty, your house is so pretty. Love the touches of blue...everything looks so classic. Marty, it looks wonderful. 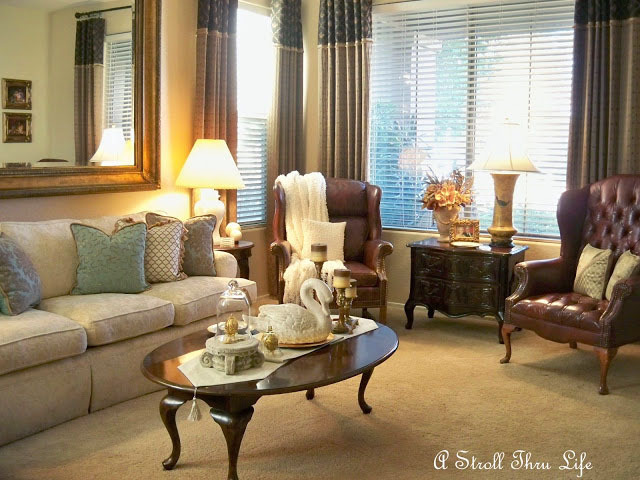 I love the feeling when you thoroughly clean your home, makes you feel so good! Hi Marty, your home looks so nice and peaceful besides being beautiful! I am still trying to get all the carts of Christmas into the attic. Your room is so inviting and I love the icy blue cushions! 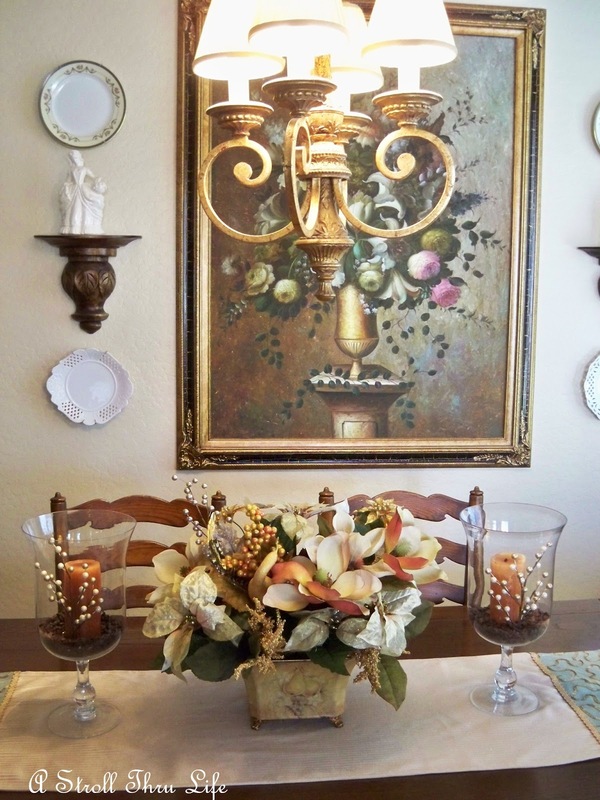 Can I say I ADORE the swan on your table. It is beautiful! I agree. I just went through my house and got rid of alot of things. I ususally do it before the holidays to help the Salvation Army out, but the family were sick and could not. Looks great. 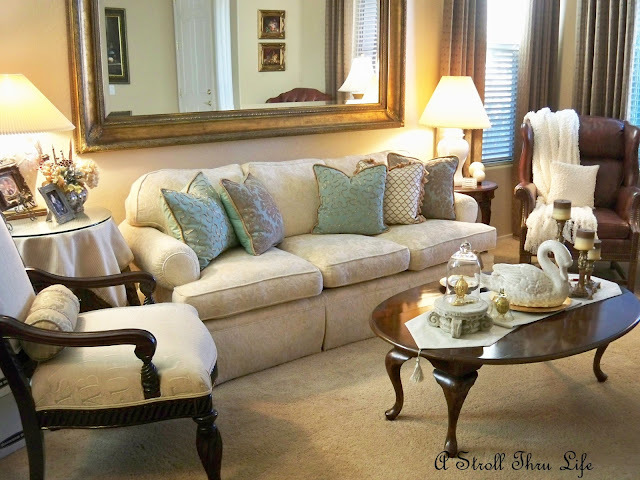 Tranquil, serene, calming...love the hues in your Living Room, dear friend! The change in vignettes is exquisite!!! 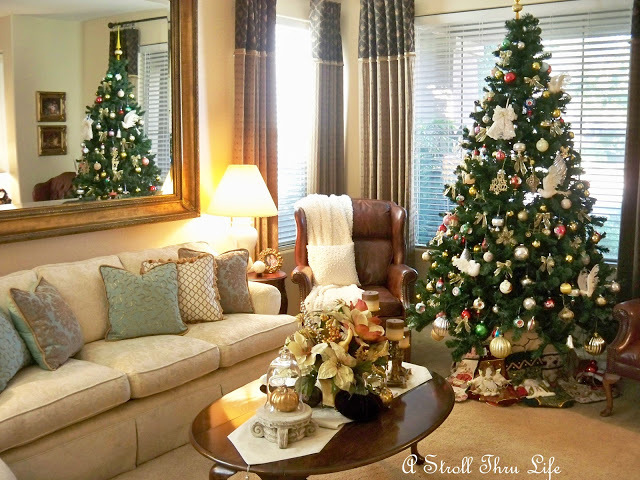 Can see your golden tinsel tree making a comeback with your Fall decor! Always inspiring @ A Stroll Thur Life!!! Yes...after Christmas I feel as if I need to do "pre Spring Cleaning"...especially to get rid of all the glitter...Your rooms looks beautiful Marty! !...I love the aqua!! Your home looks so fresh and clean now! What a great feel after all the Christmas decor is put away. 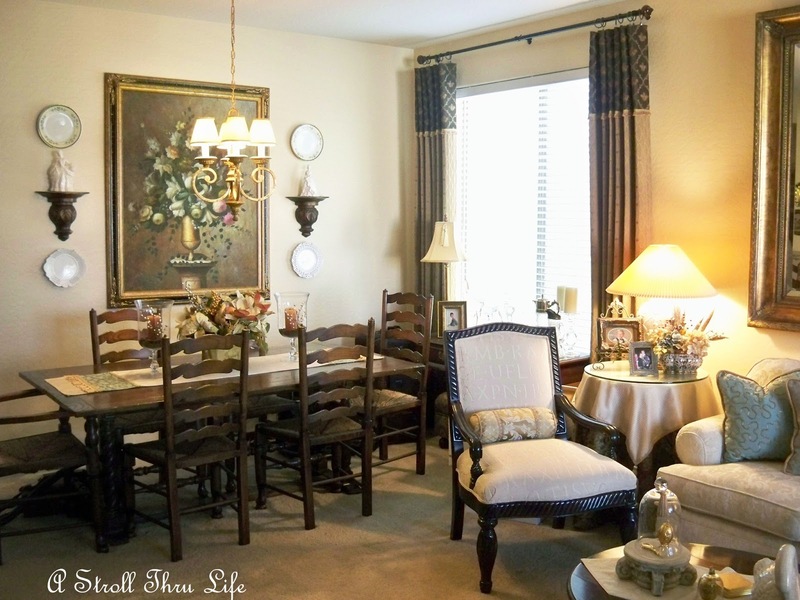 Your living room and dining room look just lovely! You have a lovely home! I totally understand what you mean about the cleaning ~ I am the same way. I just finished with mine this past weekend. Visiting from Home & Garden Thursday ~ stop by if you get a chance. Your living and dining rooms are so elegant. 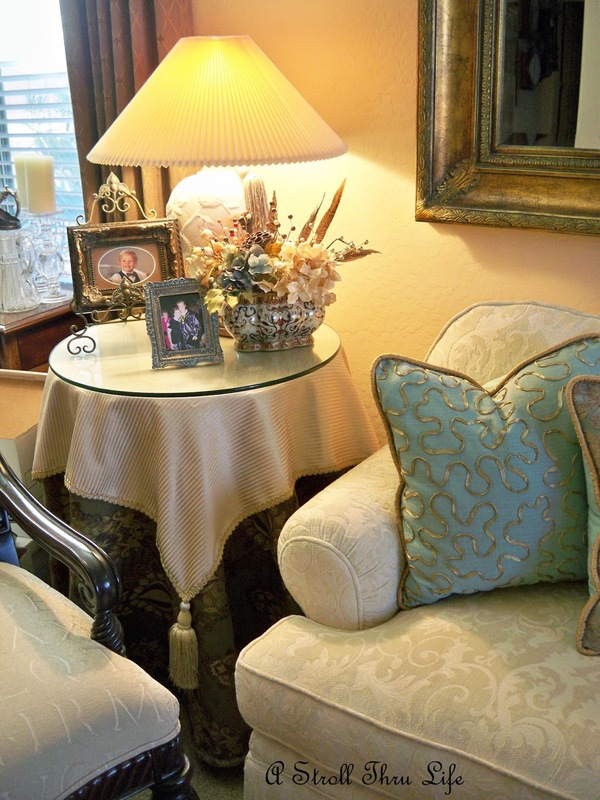 Love the touches of soft blue -- so very calming as we move past the holiday festivities. I love all the touches of gold with the soft muted colors, Marty. Marty your space looks so clean and simple for January. I love the fresh start afforded by de-Christmassing! 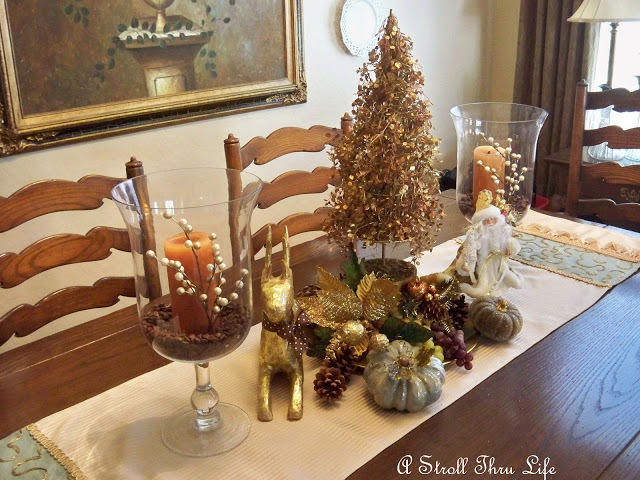 (Is that a word - if now I just made it one) :-) Your dining room table vignette is very pretty but can still be used for "winter". I would totally keep the tree (so cute) and the pine cones and add a bird or two (I don't know why but I always put birds out for winter) and get some white or sparkly winter picks or pieces to lay in the scene. I think it could be gorgeous. I am sure no matter what you do it will turn out lovely as always.